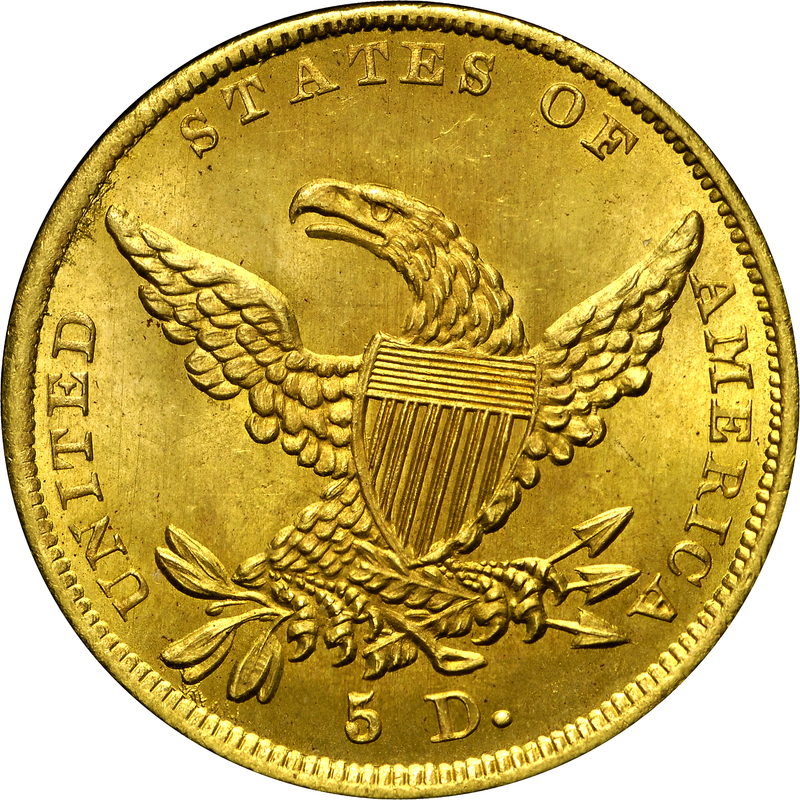 Similar to quarter eagles of this design, Christian Gobrecht modified the half eagle obverse design, giving Liberty a new hair style. 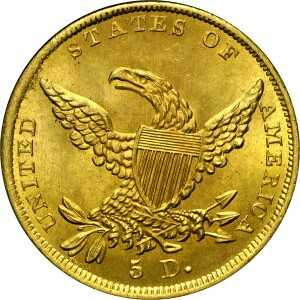 1837 half eagles are quite scarce, and truly rare in high quality such as this. 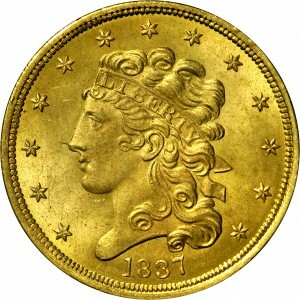 This is one of just three die varieties for this year, identified by having a single curl at Liberty’s forehead, and a berry in the branch on the reverse. Incredibly, Harry Bass had a duplicate gem-quality example of this variety. Purchased from Paramount, December 3, 1969. 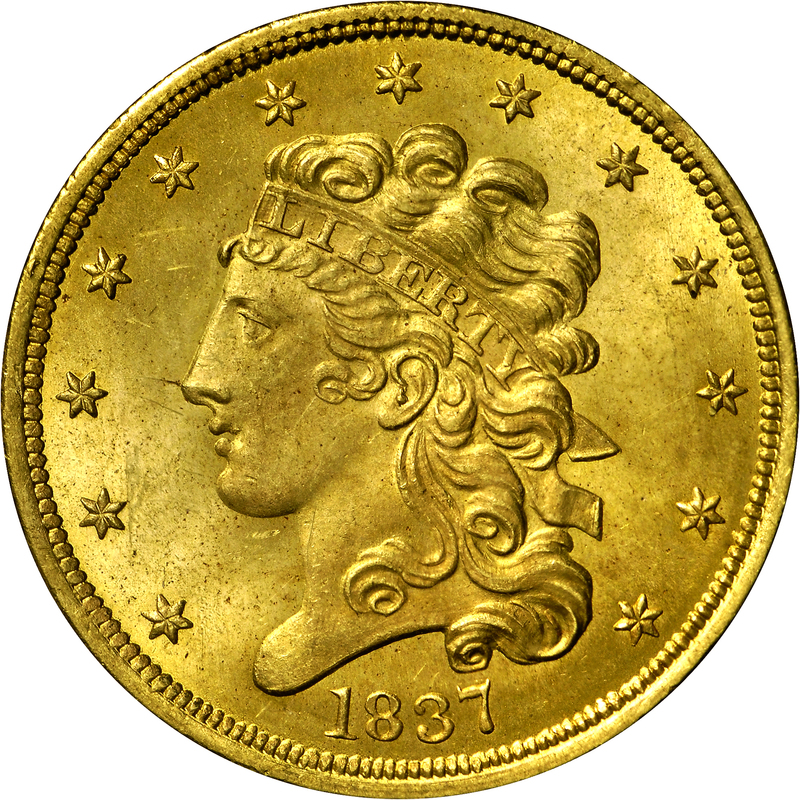 "Obverse: Tall 1 in date. Symmetrical 8. Top of 3 markedly low relative to tops of 8 and 7; its cusp not extending to knobs. Top of 7 slightly curved, centered under curl (distinctive). Clear die center punch in ear. Single forelock. Star 6 above and apart from front hair. A(M) joined to wing. Reverse: Oblate berry, its length less than that of its stem. Stem of top leaves pair attached to other stems. 5 recut, remnants of first at top left and beneath right tip of final 5. D separated from 5 by about the width of the D. l 5. Roughness and curved die scribe line visible at denticles opposite right wing tip. Field lump to left of T(E)."